A year ago, April temperatures were warm. This year, it’s been cool — especially the overnight temps, which have approached the freezing mark. As a result, my patience to get my hands dirty and to get my tropicals into the ground has grown thin. My solution? An experiment. Since I did not start any seeds in the potting shed this winter, it’s quite empty. My plan is to plant the Elephant Ears and Canna in pots, place the pots in the potting shed, and then let the heat get their juices flowing. And that’s the purpose for this repost — I’ll be doing exactly as I spelled out a year ago. Happy gardening. 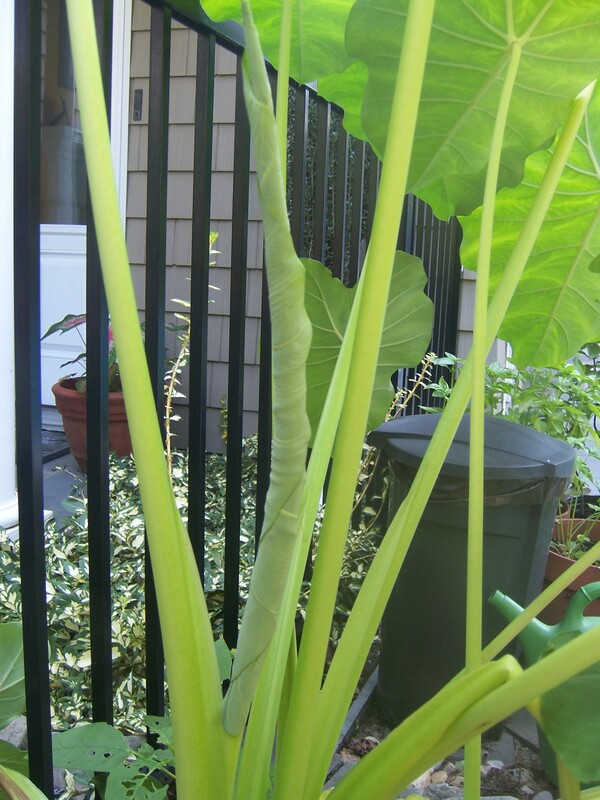 The last time I saw my Elephant Ears, they were clipped back, packed into peat moss, and stored in a cement bunker. With the very warm April temperatures, I couldn’t resist opening up their winter palace. But unlike Geraldo Rivera and Al Capone’s vault, I found my treasure. I don’t think I’m too far off when I say that most people are fascinated by hummingbirds. Delicate yet swift, they confound gardeners, bird watchers, and photographers alike – all of whom wait patiently for one to appear. And when one does, an excited whisper passes through the crowd, as if Beyonce has just walked up to the feeder. “Oh, there she is. She’s right there. Oh, look at her . . .” Then, as quickly as a hummingbird appears, it zips away. 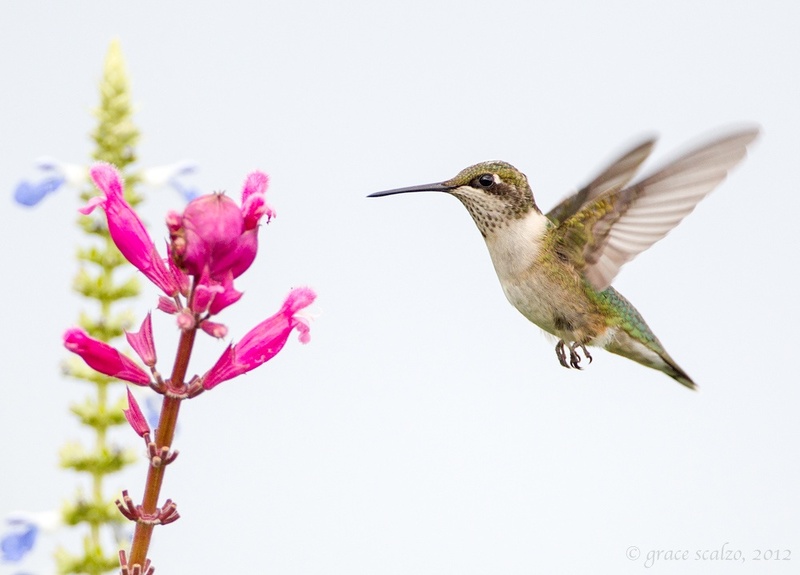 I haven’t seen a hummingbird since I was a child, but that certainly hasn’t dampened my fascination. So when my friend Michele suggested a field trip to the Baiting Hollow Hummingbird Sanctuary, I jumped at the chance. Would I see one? Would I even be able to snap a picture? Located on a bluff overlooking Long Island Sound, the Sanctuary is more than a labor of love for its founder, Paul Adams. It is a passion. 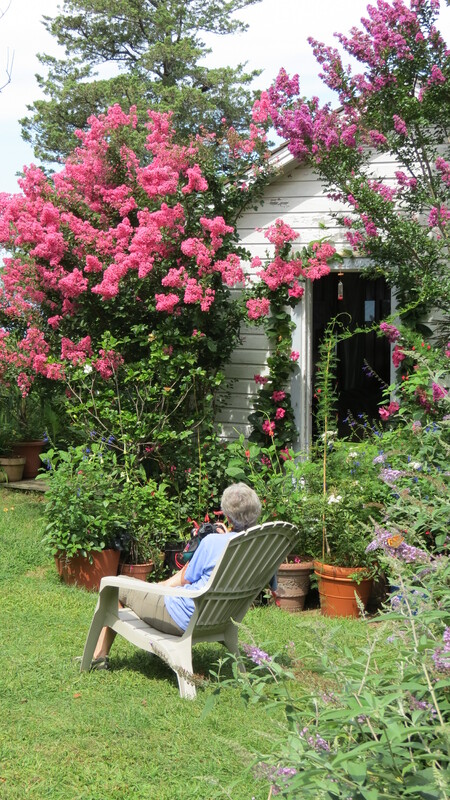 His three-and-a-half acre garden is, at first glance, in a natural state – filled with native trees that provide perches and nest building materials for his guests of honor, hummingbirds that migrate from Mexico and Central America. 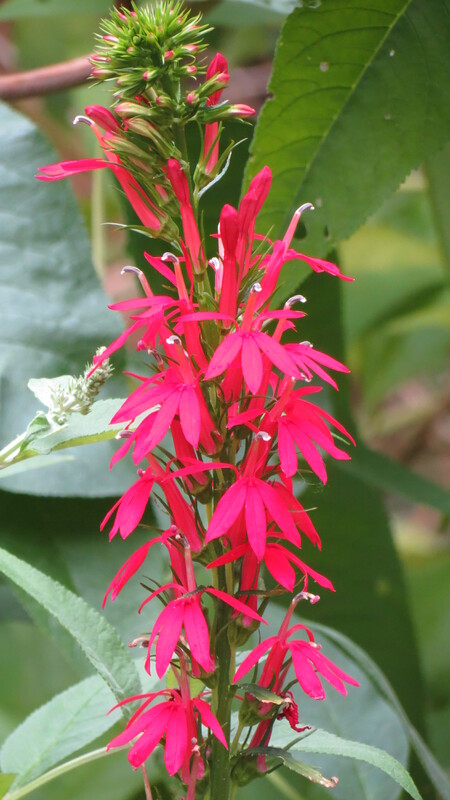 Then, all around, are splashes of sweet nectar and color, thanks to butterfly bushes, salvias, cardinal flowers, trumpet vines, honeysuckle, and a selection of tropical flowers to make the hummingbirds feel more at home. There is a small, tree-shaded area for parking and, fortunately, I listened to Michele about wearing a good pair of walking shoes. The ground is uneven, and there are some crudely built steps to help visitors negotiate the ups and downs of the garden. 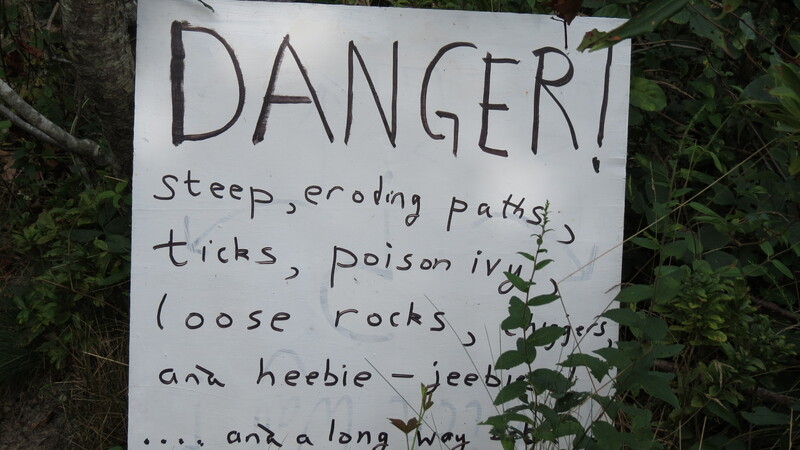 And be sure to mind the hand-painted signs – all of which are there to help you safely explore. The first stop for Michele, me, and two other friends, Jeannie and James, was a hollow, accessible by a tighly packed dirt steps. At the bottom, a large sign reminded us to be quiet – and it was like entering a church. 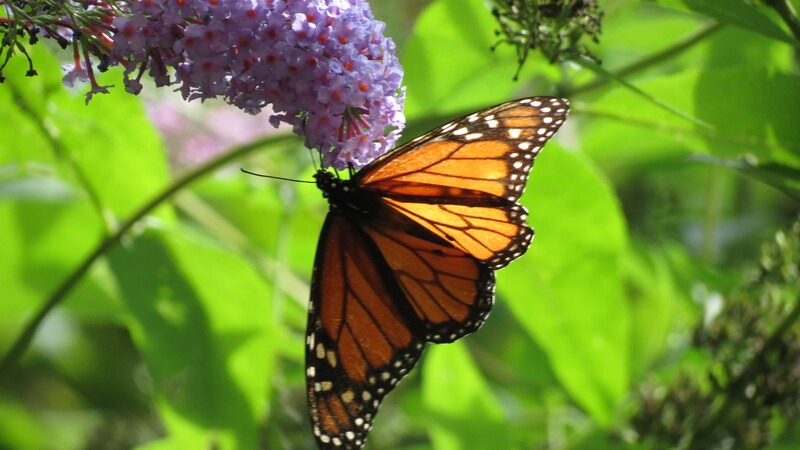 We were dwarfed by walls of butterfly bushes, accented with the stained glass hues of butterfly wings. We then strolled under a canopy of wild cherry, oak, and beech trees, all the time keeping our eyes glued to the various feeders, hoping to catch a glimpse of a hummingbird. My hands gripped the camera. 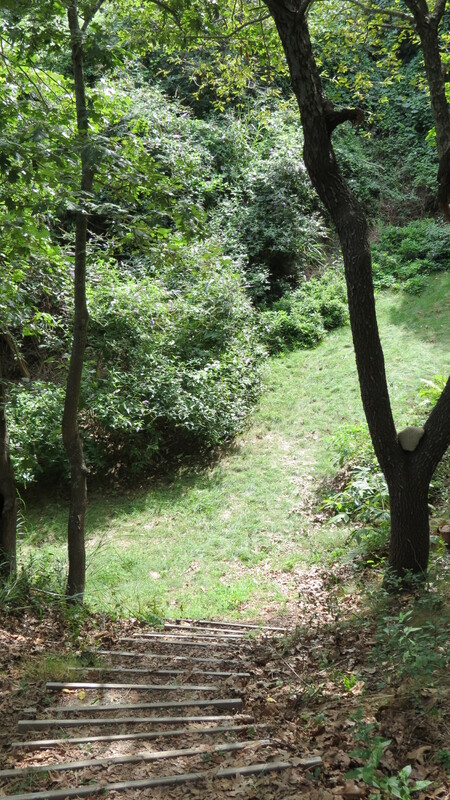 Eventually, we made it to the cottages, one of the most peaceful locations on the property. 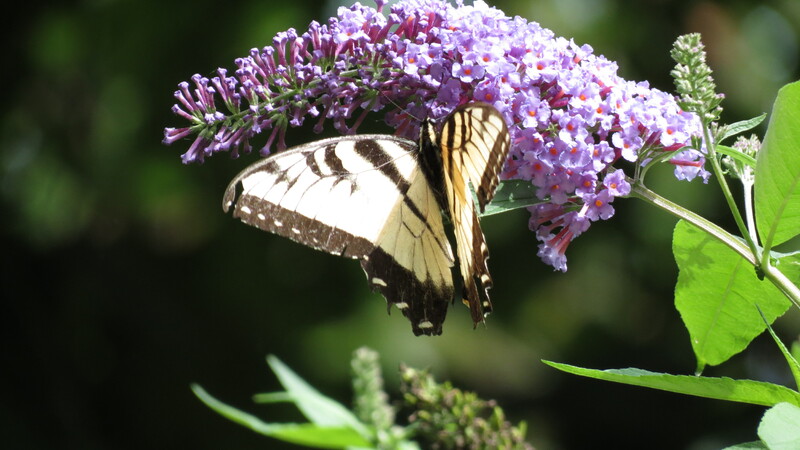 Here, visitors sat patiently in Adirondack chairs, cameras in hand, waiting for a hummingbird to arrive by a feeder or to enjoy the nectar from any of their favorite flowers. Every head turned and there was the collective whisper of awe. Instinctively, I snapped a photo. 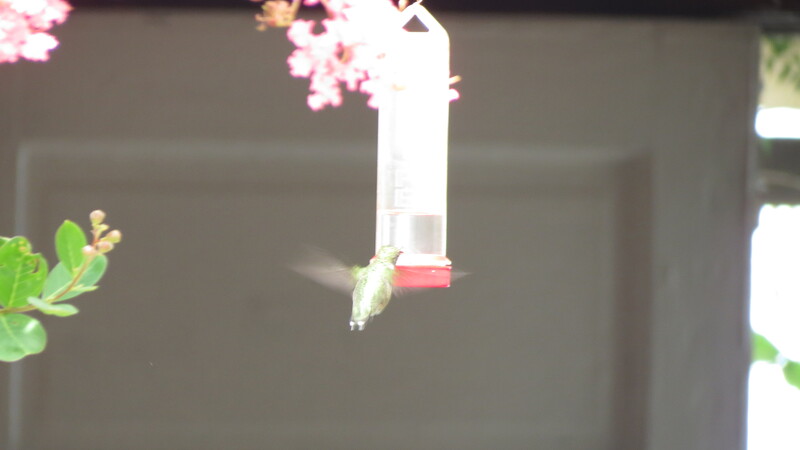 There was no time to zoom and I hoped the digital camera would be able to focus faster than a hummingbird’s wings. 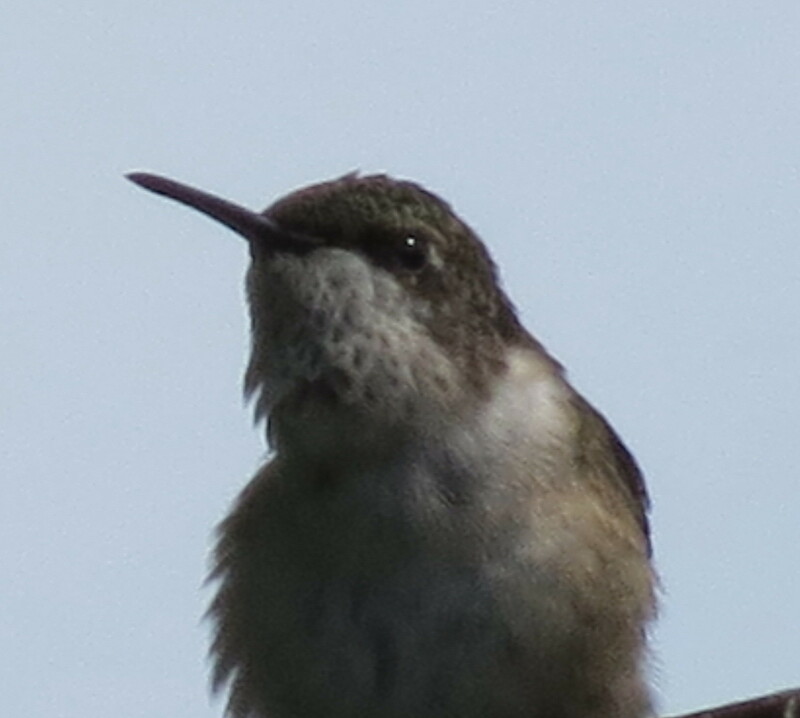 At some point, I began to wonder if the hummingbirds were playing with all of us. It’s as if they knew we were waiting to capture their image, and when they saw all of the cameras take aim, off they flew. One even hovered above the deck where Mr. Adams was speaking to us, but as the cameras were lifted, so too did the hummingbird. Gone. 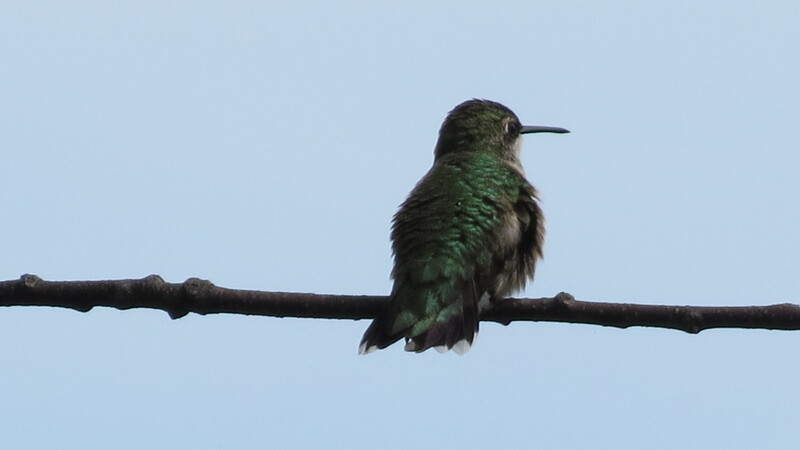 Just as I was about to pack up the camera, one hummingbird seemed to feel sorry for us and sat on a branch, preening and posing itself. And I had my close up. At last. Not only is it remarkable to have seen a hummingbird in the wild, it’s an inspiration to meet a man so passionate about his love that he is willing to share it with the public for free. Yes, you read that correctly. The Sanctuary has no admission fee. In fact, Mr. Adams will not even accept a monetary donation (his website encourages donations to other specified organizations), although sturdy old chairs and plants are always welcome. The Sanctuary is only open in August. 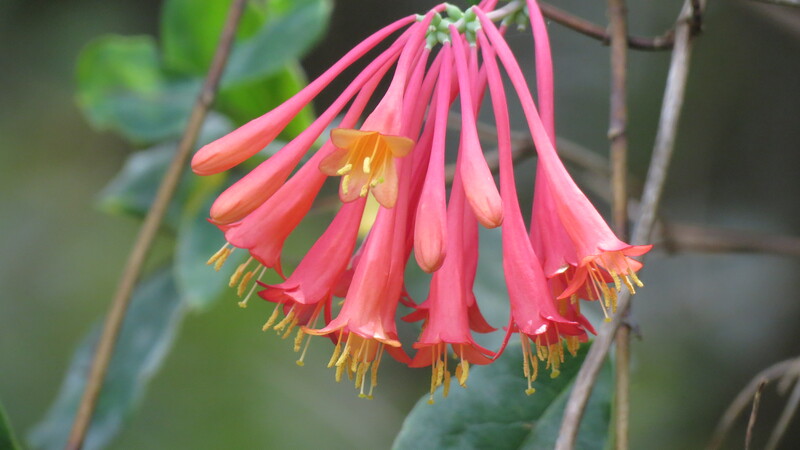 For more information about the species, the Sanctuary, the battle to protect it from development, starting your own hummingbird-friendly garden, as well as days and hours of operation, please visit either the website or blog. I know. I know. This was supposed to be the on-the-road post, the one where I post a picture and you write the caption and Joe and I drive back to New York. The car, though, had other plans and is now sitting in a repair shop — which means the you-do-the-writing post will have to wait. As will we — waiting for our car and for the arrival of Saharan dust. Yes, you read that correctly. A cloud of Saharan dust is making its way to South Florida. Forecasters say the most noticeable effect will be a milky, hazy sky — nothing blue about it. All I know is that it’s a little something extra to make the heat feel hotter. I guess you could say it’s a dry heat, and how often can that be said in Fort Lauderdale? So what should a couple of disheartened travelers do on a clear, dust-free night? Take a walk, of course. 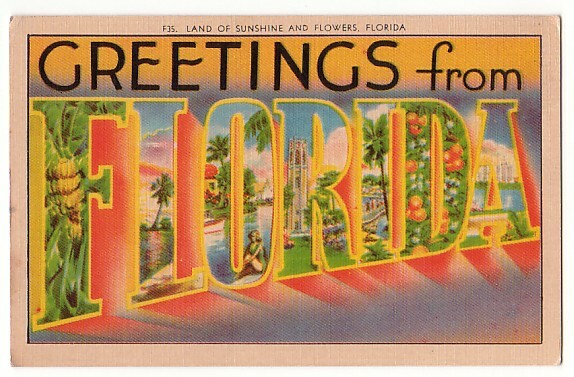 Florida? In summer? Are you nuts? If you’ve read any previous posts, you already know the answer to that question. But in this case, there is a reason to the madness. In a nutshell — a coconut shell, that is — South Florida will someday be our new home. About one month before Hurricane Andrew arrived in 1992, Joe and I purchased a house. Each year since, we have traveled to Fort Lauderdale several times a year to do the most relaxing of vacation activities: yard work. And as we go about our palm tree trimming and bundling and bagging of debris, we do a lot of planning and dreaming. 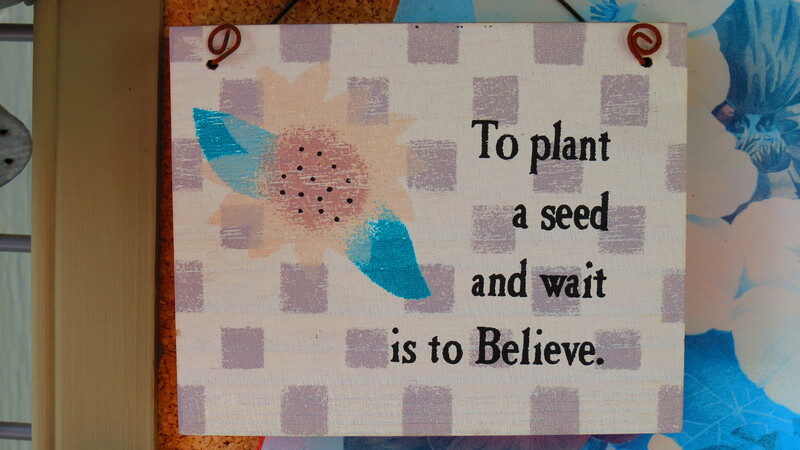 This plaque, a gift from my friend Maria, hangs in the potting shed. Simply put, I’m a sucker for seeds. I can’t really say if it’s magical or spiritual, but I am amazed at what is locked inside each oddly shaped, variously sized seed. Just provide the right environment, and it’s as if the Big Bang is put into motion. Roots, stems, leaves, blooms, seed — it’s an ongoing cycle that is so simple (and yet so complicated) that it helps keep me grounded in this hectic world. It’s one thing to stop and smell the roses, but it’s another thing to stop and plant a seed and wait and then smell. My Park Seed and Select Seeds order has arrived, and very soon, I will begin my own cycle of planting and watering and thinning. 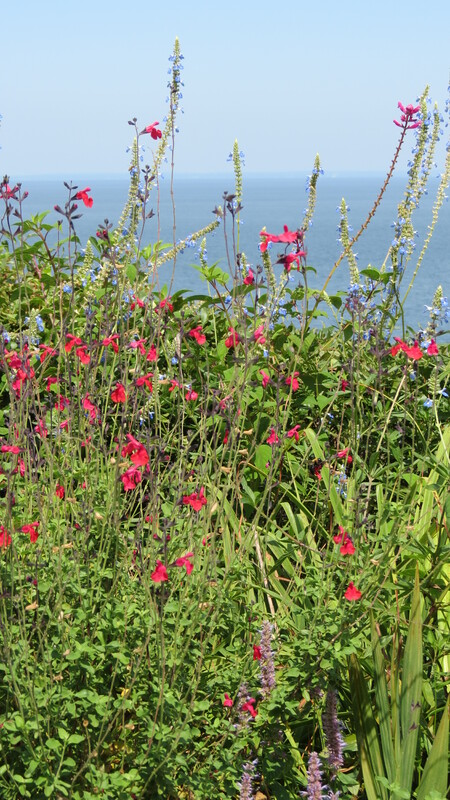 I admit, I went a little heavy on red — but I do love red in the garden. It’s hot and vibrant and passionate — and it comes in so many shades, from bright to brick to bold. And now, without any further delay, I would like to roll out my red carpet. Have you ever sat under an Elephant Ear leaf? I’m not sure what made me even think to do this, other than my curiosity to see one of my favorite plants from a whole other perspective, but as I looked at the leaf’s underbelly, I reflected on all of the reasons that make me love Elephant Ears. 1. Well, there’s the simple fact that I can lay on the ground and look up at the leaf. It’s a great place to take an afternoon nap, enjoy the shade, and look at the play of sunlight hitting the leaf’s upper surface. From below, it glows, much like stained glass does when its illuminated. 2. The color. 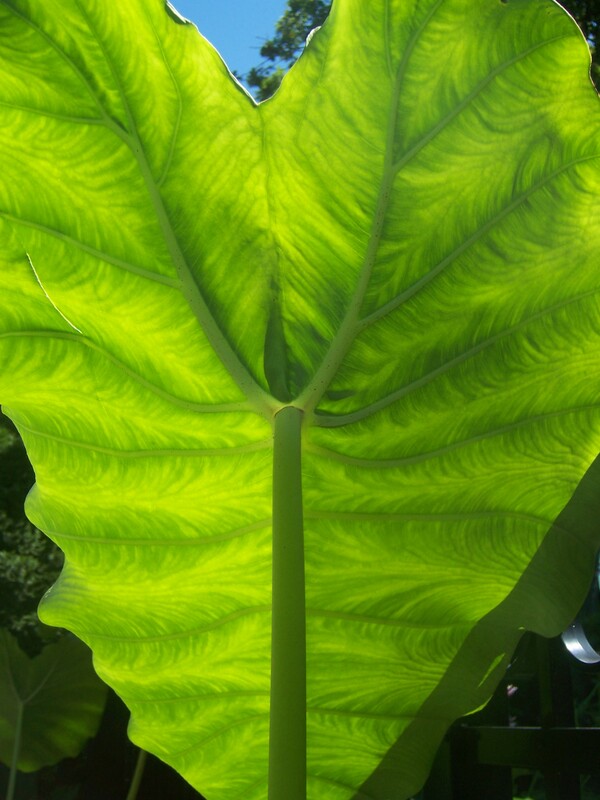 Look carefully at an Elephant Ear leaf, top or bottom, and see the swirls of shades of green. It looks as if it’s painted, and the greens always look refreshing. 3. They’re waterproof. Each morning it’s a treat to see pearls of dew gathered in the folds of the leaves, or perhaps what’s left from an overnight rain. When the morning light hits the beads, they look like drops of mercury or silver. I often think that if I find myself on “Survivor,” I would roof my shelter with Elephant Ear leaves, or at least use one as an umbrella. 4. Size matters. As the season progresses, leaves unfold larger and larger. One leaf can measure 3 feet. I have found that when I keep the plants in a pot, they remain stunted. Plant them in the ground, and they let their presence be known. Similarly, one large leaf placed in a vase can be just as dramatic in the house. 5. Taste of the tropics. 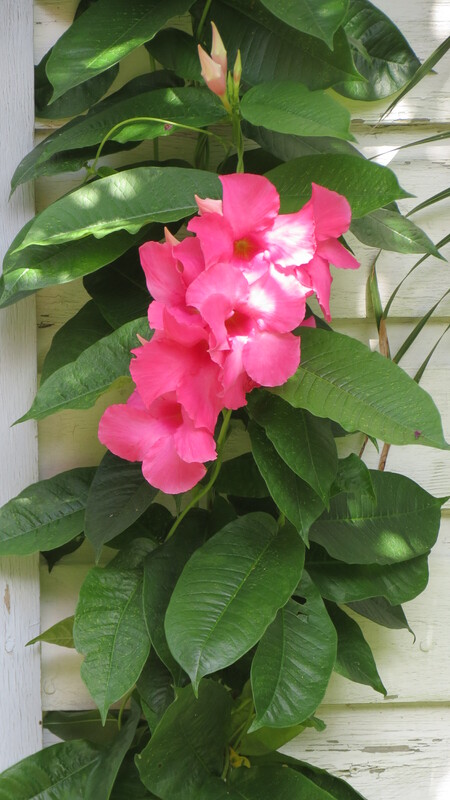 As a Zone 6 or 7 gardener, depending on the specifics of the Cold Hardiness map, I like to create a tropical feel in the yard. 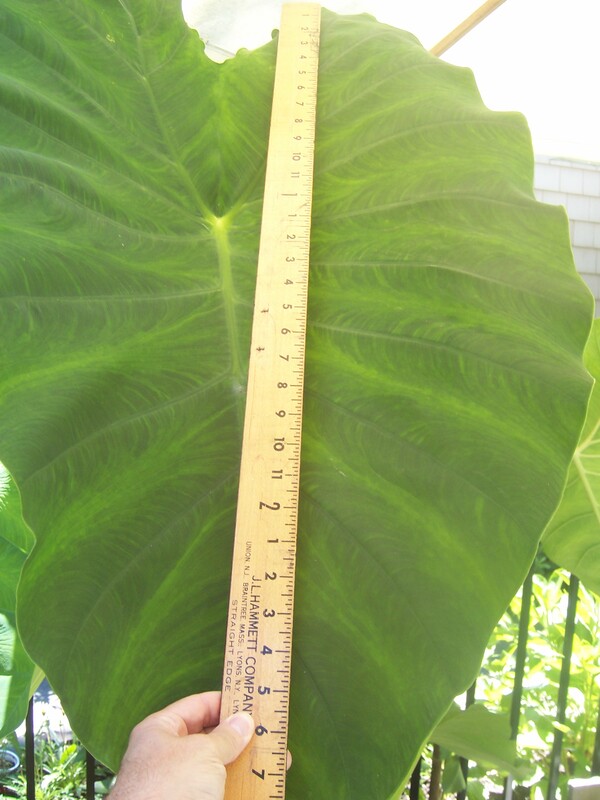 Elephant Ears are more than able to create the illusion that my Long Island garden is in South Florida. 6. Easy care. As much as I dislike fall clean-up, it’s necessary when it comes to Elephant Ears. Right around the first frost, I’ll cut back the leaves, dig up the bulbs, and let them cure for a few days. I’ll try to shake out much of the excess dirt. 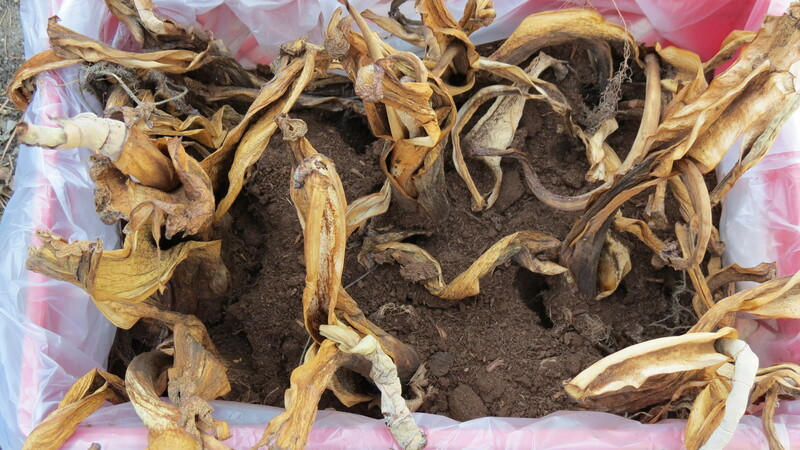 The dug bulbs are then placed in paper bags and covered with peat moss. Lately, I’ve also tried plastic bags, and this also seems to work, as long as I keep the bag open. Either way, I place the bag in a cool, dry place, such as the cement bunker that is behind a bedroom closet and under the front steps. In the spring, I’ll bring out the bulbs, pull off the dead roots and tops, plant them in pots with the tip just below the soil (maybe even peaking out slightly), place them in a sunny location, and give them lots of water. Once they sprout, in the ground they go. 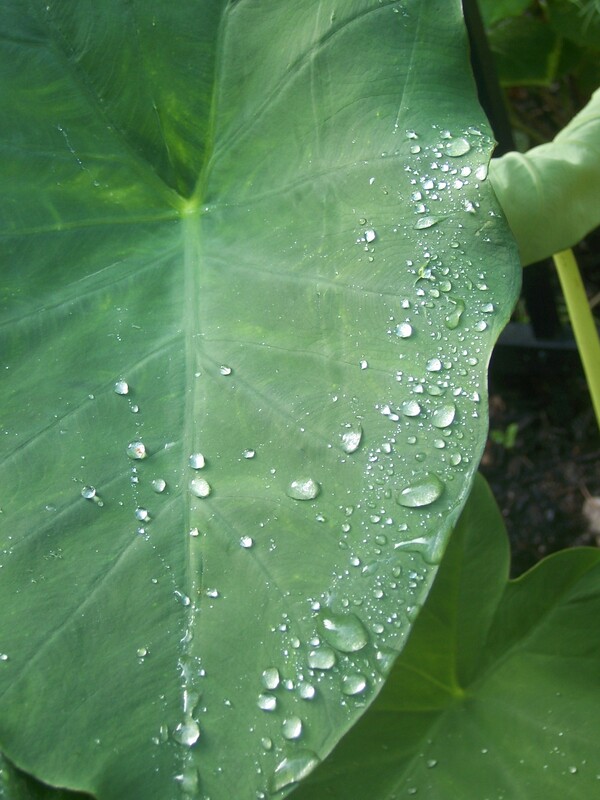 Elephant Ears are slow to start, but with water and heat and humidity, they take off. 7. They bleed. I learned this the hard way during my first fall clean-up of Elephant Ears. After cutting the stalks, I noticed that my clothes became stained with a rusty red color. I then noticed the ends of the stalks with the same color. The stains are permanent, which means that I now have work clothes specifically for Elephant Ear cutting, and they are stained with memories of previous prunings. 8. They multiply. I started with a single bulb, and now I have enough to fill one bed, and more to intersperse with hydrangeas that have not reached full height. In fact, I was so overwhelmed with babies, that I brought the extras to work and shared some Elephant Ear love. 9. They’re fun. The leaves almost bounce in the wind. I will often walk by them and tap each leaf like a drum to make them bounce. 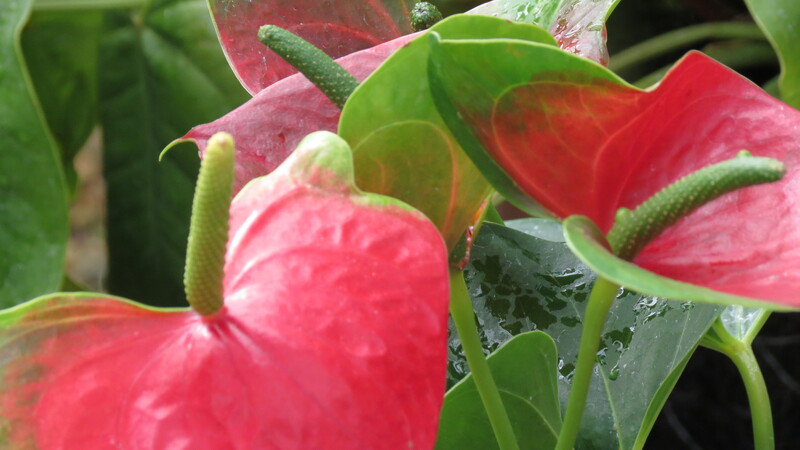 Besides, visitors will always smile when they see them, especially the larger leaves. 10. Have you ever seen a new leaf? They emerge from the stalk of an older leaf, like a tightly wound sword. And then they open, like a sail unfurling. 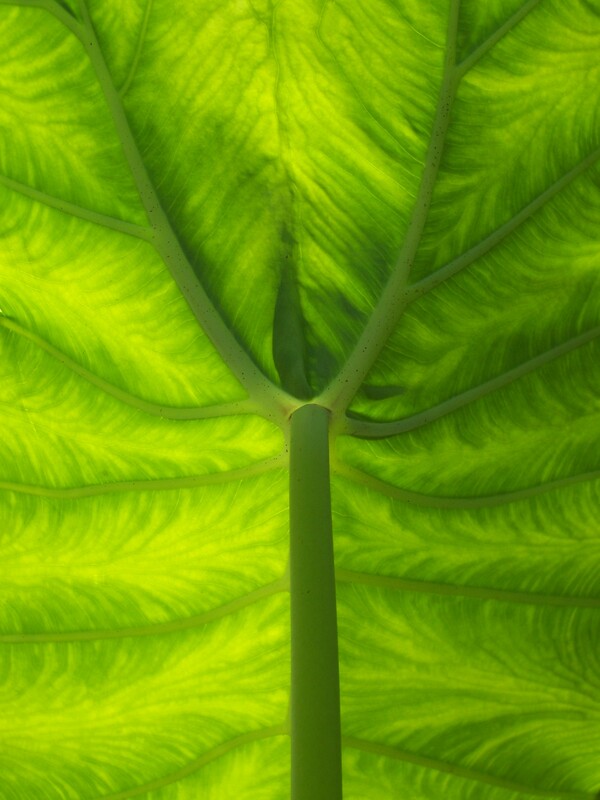 The larger the leaf, the greater the opening. That’s it for now. Happy Gardening!